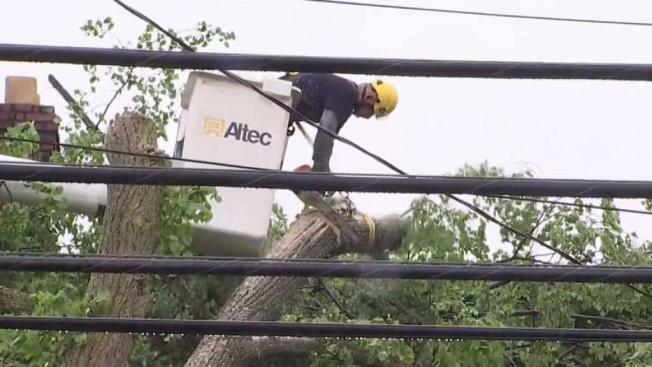 A day after a violent storm in the tri-state, tens of thousands are still without power in New Jersey. Brian Thompson reports. Tuesday's fatal storm was so strong that it actually generated a small tsunami in New Jersey, the National Weather Service said. The event is called a "meteotsunami," and as opposed to the wave events caused by earthquakes, these are instead caused by fast-moving storms. Preliminary data indicates a small tsunami at a buoy off of Atlantic City around 8:40 p.m., which resulted in fluctuating water levels for several hours. There were no reports of damage from the event. "Most meteotsunamis are too small to notice, but large meteotsunamis can have devastating coastal impacts (although not to the extreme of the 2004 Indian Ocean and 2011 Japan tsunamis)," the NWS explains in an online fact sheet. To be sure, the phenomenon is not new at all - but as it's been better studied and understood in recent years, meteorologists have improved their ability to recognize and track them.